I'm a big fan of the new Batman movies, so when I saw this small Dark Knight Tumbler at Toys R Us and realized it was RC, I didn't think twice before putting it in my shopping cart. 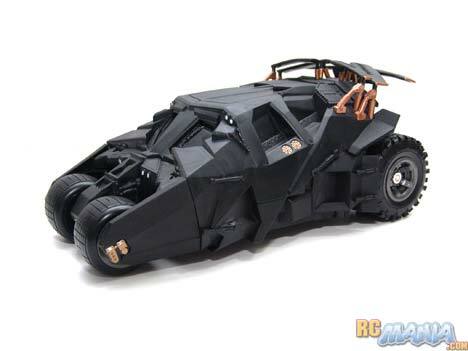 It looks really great on the outside, almost identical to the real Tumbler in the movies. There's a ton of detail from every angle and the matte black finish is mean. 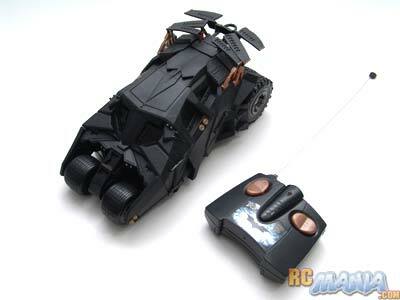 I also like that the controller matches the car, with the same colors and a Dark Knight sticker. Why does this matter to me, though? Like many RC maniacs, I usually own more than one RC. When the controller isn't marked, it's sometimes hard to tell which goes with which vehicle. With this Tumbler, there's no convusion. I grab the car, then grab the black controller with the copper-colored buttons. For about $30 US, I would have expected such a small car (10" long, about 1/16th scale) to include batteries, but unfortunately it doesn't. The good news is, like all Tyco 6V series cars ("6V" stands for six volts, for the fact that it uses 4 x 1.5 volt = 6 volts to power the car), it takes a total of six cheap AA batteries, 4 for the car and 2 for the controller. Many RCs use the squarish 9V batteries for controller, and those are extra expensive. Alright, time to drive this thing! What I immediately noticed is that it doesn't accelerate quickly, though its top speed is okay. I would have liked it to be a little faster. The soft tires are big enough to let it run over medium carpet without a problem, but when I went to turn, I discovered a big problem -- it doesn't like to turn. Whether on carpet, kitchen linoleum floor, or smooth concrete, the car turned in a really wide circle. To turn around, I had to go left & forward, right & back sometimes as many as ten times in medium-small areas! I actually got tired of this pretty quickly and don't think anyone would want to drive it in confined indoor spaces for long. Well, it sure looked good, but especially for the price, the performance is really poor. I can imagine any kid who likes Batman like I do getting really excited about this car when he first sees it, then getting really disappointed when he first drives it. It might be fun for awhile for the youngest kids who don't mind chasing it around and making it turn by actually picking it up & moving it, but I really feel like there are better things you can do with $30.